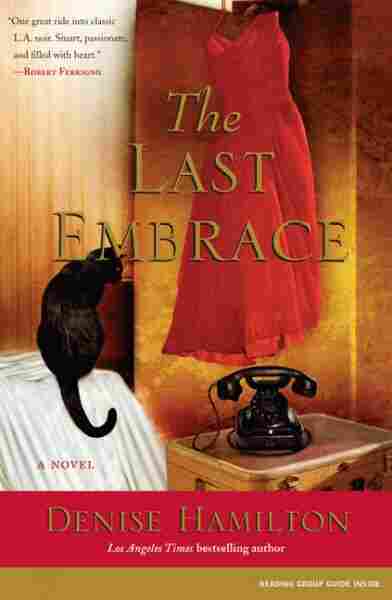 The Last Embrace NPR coverage of The Last Embrace by Denise Hamilton. News, author interviews, critics' picks and more. August 25, 2008  The Last Embrace works as literary film noir: There are bombshell babes, unsavory gangsters, and — of course — a grisly murder. It felt like she'd been running for days. With each step, a searing pain shot through her ankle. Her pace was jagged and she wanted to bend down and shuck off the other shoe, but there was no time, he was closing in, his breathing heavy and excited. She'd screamed when the man lunged out from between storefronts. The street was well lit, that's why she'd taken this route home. Just a bunch of tidy little shops, the occasional night owl walking a dog. But the shopkeepers had already locked up and no one was out tonight. He'd grabbed her, and she'd wobbled and twisted her heel. His fingers had slid off her padded shoulder. Staggering free, she'd balanced on her good foot and kicked. The strap broke as her shoe flew through the air and connected with his groin. The man doubled over with a grunt. Then time had slowed to one of those black-and-white movie stills she plastered on her bedroom walls. She'd felt herself floating above her body, seeing everything from a great distance. Her attacker staggering, clutching himself while she wobbled on one heel, torn between shrieking and sprinting away. In the way of nightmares, she could only do one. The man had straightened, an acrid, black-rubber smell rising from him. Then instinct had kicked in and she'd started running. She had to get back to the Boulevard. It was late, but there might be someone on the sidewalk, cars on the road. Laughter and jazz drifting out of supper clubs. While here there was only the wind roaring in her ears. A hand reached for her arm. She twisted and her jacket tore, buttons of carved bone popping along her front. She swung her purse, heard a satisfying crack, felt droplets splatter her cheeks. The Boulevard was closer now, but her ankle throbbed and weakened with every step. A car horn shattered the silence and suddenly she was there, the headlights and neon dancing behind her eyes. If she dashed into the street, a car might hit her. She turned, skittering over the embedded sidewalk stars. The man put on a burst of speed and made a last desperate swipe, his fingers sliding through her hair. "Help!" she screamed, spying two well-dressed men in a twilit doorway. Startled, they moved apart. The red neon sign above their heads read THE CROW'S NEST. "Help, oh God, help me." "Sirs, please!" came a man's voice behind her. "It's my wife. She's been drinking again...must get her safely home." The voice dropped, grew wheedling and reproachful. "Come back, dearest. You know no one's going to hurt you." "He's not my husband," she screamed. "Oh, someone, please help me!" The men in front of the Crow's Nest slunk away and disappeared. She ran to the door and yanked, but it was locked. From inside, she heard music and laughter. She pounded, crying "Help!" but took off running as the slap of feet drew near. Up ahead, a car slowed for a red light. "Wassamatter, miss?" called a voice from the open window. It was a black Studebaker, the driver leaning over, holding something aloft that reflected off the streetlight. A shout went up behind her. "Sir! Grab her, please. She's not well." The man in the car cruised alongside. He was alone. Without thinking further, she reached for the door handle and hauled herself into the backseat, slamming home the lock. Ahead, the light turned green. With a screech of tires, the car took off. Braced against the leather upholstery, she tried to catch her breath. The car's backseat was bigger than the Murphy bed in her apartment. In the gloom of the car, she saw only the outline of her rescuer's head. The streetlights flickered past, making a jerky magic lantern inside the car. She saw a hat, checked jacket, square-cut jaw. Smelled cigars and leather. "Well, well," the man said, "Do you always tumble so spontaneously into strangers' cars?" She gave a wet hiccuping cry. Her ankle was swelling and throbbing in excruciating rhythm with her heart. "A m-man chased me down the street," she stammered. "He wanted to..." — she squirmed at the memory — "to do me harm." The man's voice cut across the music on the car radio. "Good thing I came along." He tossed back the thing he'd flashed from the car. She caught it, ran her thumb along the embossed surface. A badge. Was it real, or a studio prop? Its very curves, the cold metal in her hand, unnerved her. He passed back a silver flask. "Calm your nerves." His hand was large. A man's ring, set with a stone and a crest, adorned his middle finger. She took a slug, confused about how close she'd come to being killed. No young woman in Los Angeles could forget Betty Short's murder two years earlier. The one the press had nicknamed the Black Dahlia. For every girl who'd ever walked home to an empty apartment, accepted a date with a man she didn't know well, waited at a bus stop after dark, the fear still lurked, stronger at times, dimmer at others, but always the same refrain: It could have been me. It could have been so many young women I know. And they never did catch him. She had her own reasons to be wary. "You're some kind of detective," she said, putting together the badge, the unmarked car, the plainclothes. She still hadn't gotten a good look at his face. "You should arrest that animal before he attacks another girl." The man snorted. "You've just blown my stakeout sky-high. I should blow my cover too?" "That's what cops do, isn't it?" she said thickly. If they were honest. If they listened to what a gal told them and did their job. "That man would have killed me. I could tell." He appraised her in the rearview, in that clinical way cops did. There was something about his eyes, she wondered where she'd seen him before. On the studio lot? At a nightclub? The Hollywood Police Station? Self-conscious, she scrubbed at her cheeks. Glancing down, she saw the popped buttons and covered herself. She felt queasy, but she could handle it, only a few more days. "...a damsel in distress," the driver was saying. "Aren't I lucky." There was a gloating, hungry tone to his voice. The big car turned smoothly to the right. She felt suddenly that she was on a tilt-a-wheel and wanted to get off. "If you could drop me at the nearest police station, I'd appreciate it," she said. "Hollywood. Is that where you're based?" She angled the badge, trying to read it, but the streetlamps did not cooperate. "Then what are you doing here? I intend to make a full report, you know." "Do you really think that's wise?" Alarmed, she scooted over on the plush leather, snicked up the lock button. "Oh, all right, police station it is," the driver said, his voice mocking. "I hate to disappoint a pretty girl." Instead the car turned again, pulled to the curb, and stopped. The man slung his arm across the seat and turned. For the first time, she saw his fleshy, handsome face. Again, it triggered some memory. "Why are we stopping?" she asked, her hand sliding to the door handle. Her senses thrummed with distrust. But after all, he had rescued her. The man held up an empty pack of cigarettes. "I'm all out of smokes," he said, crumpling the paper in his big hand. She scanned for a newsstand or a liquor store but saw only dark, shuttered buildings, a restaurant at the far end of the block with taxis lined up. She looked back at the driver, not liking the look that was spreading like a grease stain over his face. Her fingers tightened around the handle, about to fling it wide. And then she must have done so, because the door swung out. As she steeled her body to flee again, a figure loomed outside and she smelled the acrid odor of black rubber. The man climbed in, shoving her across the length of the backseat. She hit the far door and began groping blindly for the handle. "Sorry about that," the newcomer said. "The little minx isn't getting away this time."